The superfine sander with linear sanding motion (as opposed to rotary or orbital) operates at 8,000 strokes per minute with a 2.5 mm stroke. Stable housing of fibreglass reinforced POLYAMIDE. 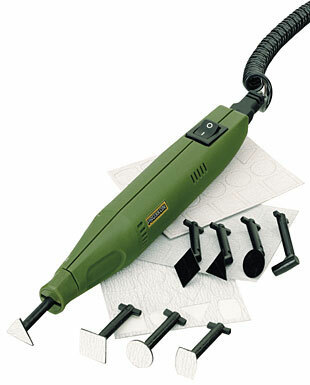 It is ideal for surfaces, slots and tight corners. Four sanding arbors of different shapes as well as 3 sheets of pre-profiled self-adhesive sanding pads are included. The sheets are of grits 180, 240 and 400 with 5 of each shape per sheet. A mains adapter of at least 12 - 18 V DC is required. 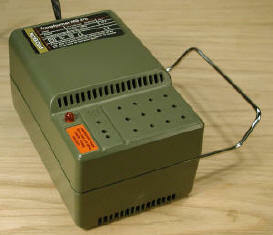 We recommend MICROMOT power supplies NG 2/E or NG 5/E. The electronic speed control on these units allows the selection of different speeds for different applications and materials. Three sheets, each with 20 pads. Self-adhesive. 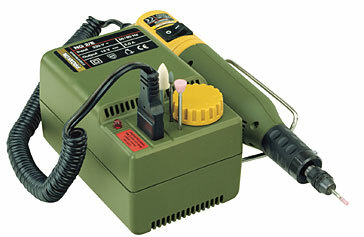 Click the button below to add the PROXXON PEN SANDER 12 VOLT 28594 to your wish list.